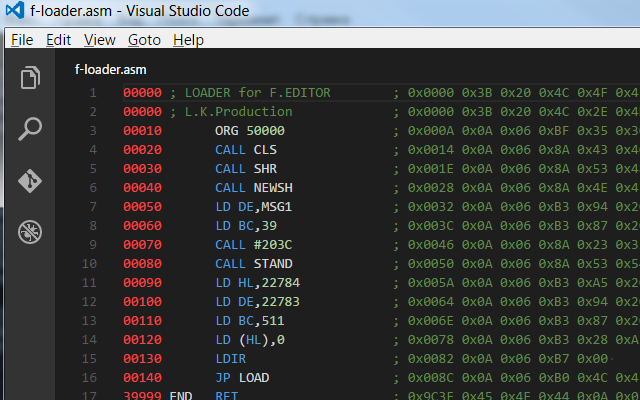 Visual Studio Code>Programming Languages>Zeus Z80 AssemblyNew to Visual Studio Code? Get it now. This extension adds support for the Zeus Z80 for Spectrum 48k to Visual Studio Code. It works with sources that were generated from the original Zeus Z80 files with help of ZX Tools. Press F1 in VSCode, type ext install and then look for zeus-z80-asm. Full syntax highlight for Zeus Z80 Assembly.